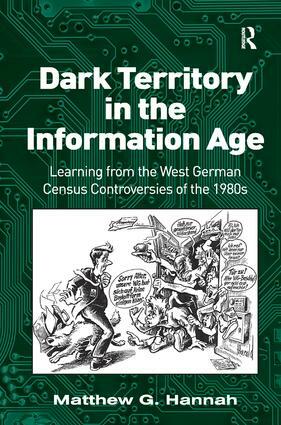 Through a detailed account of the West German census controversies of the 1980s, this book offers a robust and geographical sense of what effective 'resistance' and 'empowerment' might mean in an age when the intensification of 'surveillance society' appears to render us ever more passive and incapable of controlling our own registration. Contents: Preface; Introduction; The 1983 boycott movement: development, themes and tactics; 'The sensitivity of a steamroller'? The state at cross-purposes; Interlude; A new 'war of religion': ideological battle lines in 1987; The battle in the streets, stairwells and courtrooms; Conclusions; References; Index.